5G, the coming mobile communications standard, is the driver for the Internet of Things (IoT). Minimal latency and high bandwidths form the basis for IoT applications such as the autonomous car or Industry 4.0. A central requirement for the success of 5G is connection of the cell sites via fibre-optics. Wind turbines, washing machines, fitness bracelets, cars, machines and systems – the Internet of Things (IoT) connects billions of devices with each other or with the cloud. Another example is the smart city of the future. Those responsible can, for example, use sensor data from the IoT to optimise traffic flow, thus avoiding traffic jams and improving the air quality and everyday lives of the city’s inhabitants. A prerequisite for comprehensive networking of urban infrastructure or for the autonomous car are high-performance mobile networks. The IoT needs high bandwidths and the lowest possible latency. The latter refers to the time needed for transmitting the data between the sender and receiver. The new 5G mobile network will deliver the required data capacity in real time. The key figures for the future mobile communication standard are promising. With a data rate of theoretically up to 10 GBit/s (=10,000 MBit/s) 5G will be around 100 times faster than conventional LTE, which currently runs at 100 MBit/s. 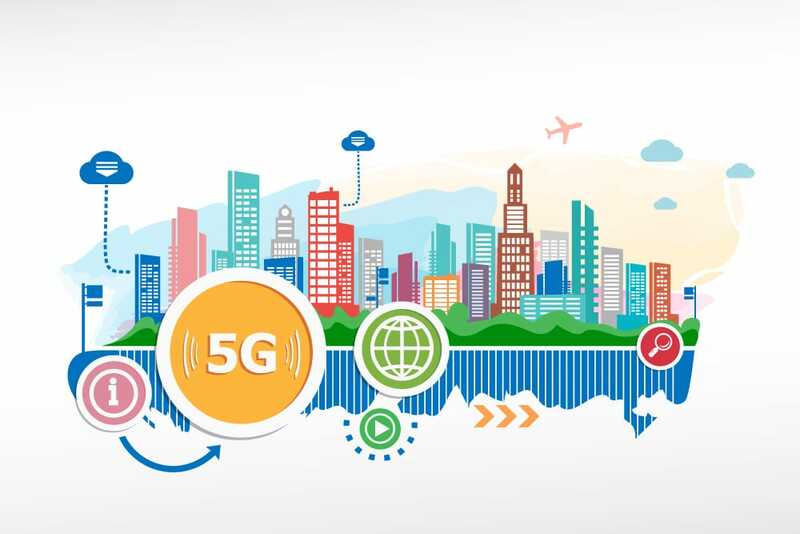 Thanks to a capacity which is many times higher, 5G will be able to supply sufficient bandwidth to many more users in a network cell than is the case today, while requiring considerably less power. The greatest advantage is the extremely low latency of less than a millisecond. But it’s not ready yet. 5G is creating great challenges for the mobile communications sector. As yet, there are no standards. All the same, at the end of February in Barcelona, OEMs such as Huawei and providers such as Telekom or Vodafone presented initial prototypes and preproduction demonstration models at the Mobile World Congress 2018. The first standard package should be ready in mid-2018, so that the first networks can go live as planned in 2020. In addition, one of the most important mobile communications resources is becoming scarce: the spectrum of frequencies. This is because increasing volumes of data and higher transmission speeds require more spectrum. But in today’s mobile communication bands, the spectrum has mostly been used up. In Germany, for example, LTE is available on the frequency bands 800, 1800 and 2600 MHz. So new frequencies will be needed to extend mobile communication capacities further. Here the federal government sees potential for 5G in the spectrum around 3.5 GHz or the very high frequencies in the “millimetre” band above 24 GHz. The disadvantage of these high frequencies is a signal range of only a few hundred metres. This means 5G will also require new mobile network architecture, based on small cells with small antennas. These small networks can replace mobile phone masts, making 5G a kind of “network of networks”. To be able to handle large quantities of data with low latency, the cell sites – i.e. the base stations spread over the area, consisting of small cells, radio masts or houses with antennas – must be well connected to the higher-level network components. The technical term for this is backhaul. Today, the backhaul must provide high transmission rates with the lowest possible delay times and losses. As well as via radio relay, these connections are, in part, already being made via fibre-optic cables. With its high requirements in terms of data rate, latency and reliability, 5G will not be possible to implement without significant expansion of the fibre-optic network. In brief: 5G networks require a fibre-optic infrastructure and convergent fibre-optic/mobile networks. Fibre-optic internet is the premium broadband technology. Fibre-optics are characterised by low losses (enabling greater distances) and relatively good resistance to electro-magnetic interference (interference due to machines, switches, lightning, transmitters) and light. The actual performance of a fibre-optic connection depends upon how far the fibre-optic cable is from the end customer. Variants are Fibre To The Curb (FTTC), Fibre To The Building (FTTB) or Fibre To The Home (FTTH). The closer the fibre-optic cable is to your home, the higher the data rate. Generally, bandwidths between 50 MBit/s and 300 MBit/s are achieved. Of course, the best transmission is when the fibre-optic cable runs all the way into your home (FTTH). Green IT Solution GmbH is an expert partner for planning and implementing a FTTH project. We will handle the project management and the consulting, delivering intelligent and cost-efficient hardware solutions. And you can rely on strong partners from our FTTH network.